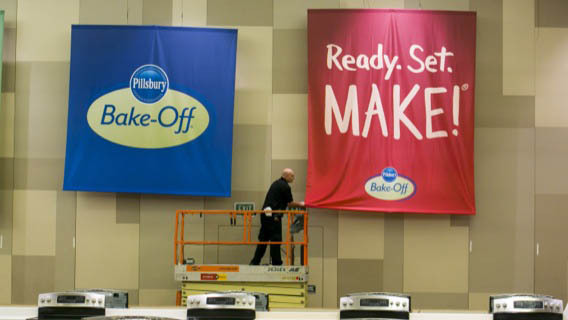 Now that my status as a finalist for the 46th Pillsbury Bake Off had been confirmed, my husband and I were left with a dilemma: do we take the whole family out to Vegas, or do I head out solo? The kids were eager to go; they wanted to see mom in action. My husband and I were hesitant. 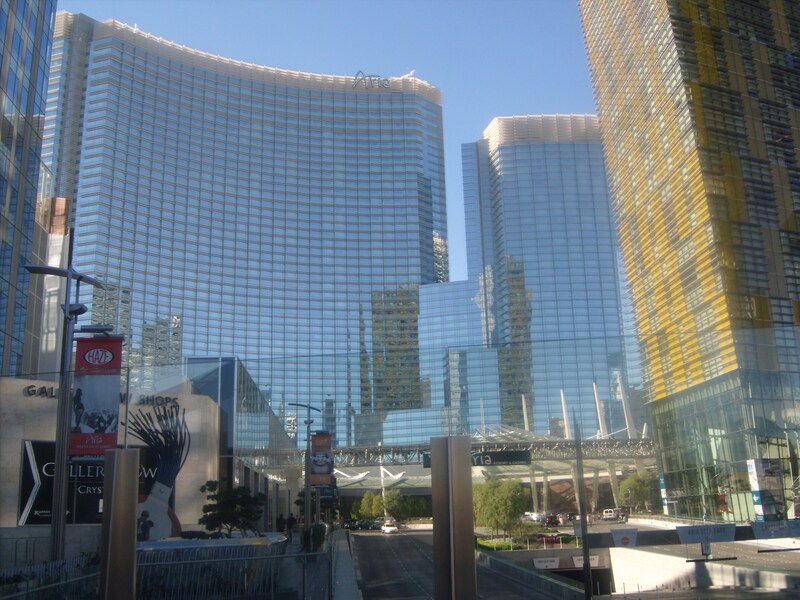 Las Vegas, a place neither one of us had ever been to, just didn’t seem all too family friendly to us. To our surprise, many people told us to the contrary. They provided a litany of kid friendly attractions that we were sure to love. Even our pediatrician suggested that we take the kids along. We prayed about it and simply asked that the Lord close the doors shut if it wasn’t His will. Well, door after door was not only closed, but slammed in my face. It was becoming abundantly clear that I would be traveling solo. The structure of the contest was so, that I had nearly 8 months before I would actually compete at the Bake Off. As a result, life continued on as normal. I made sure to practice my recipe whenever I could. 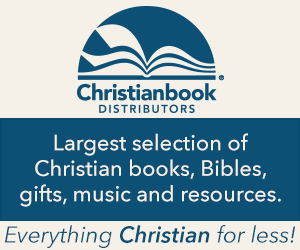 Meal at church? Kids over to play? Family over for dinner? Meatball and Breadstick Sub Skewers it was! My recipe was a bit finicky so I welcomed the extra practice. The skewers had to be assembled just so to insure that they would have the look I wanted. I took every minute of the 30 minute preparation time limit to put them together. After a few rounds of practice, I felt confident that I could make these skewers in my sleep. I was also comfortable because the recipe was so reliable. Each batch turned out exactly the same. There were no variations or problems. If I could keep my nerves under control at the Bake Off, I felt reassured that my recipe would be a success. Reality finally crept in as September approached. The Bake Off was only weeks away. My airline ticket was booked. A few extra meals were in the freezer for my family. I had a pile ready for the suitcase. This was really happening. I was very thankful that a friend from North Carolina had decided to fly out to Vegas to meet me. The Lord had provided a friendly face for me. I was a bit relieved. I have to admit that the actual travel frightened me a bit. I had never flown alone. Never navigated an unfamiliar airport alone. Never traveled without my family. Never had been a couple of thousand miles away from my loved ones. Some people may look at those statements and think how sad that is, how sheltered I must be. I look at those statements and see a tight-knit family that doesn’t like to be so separated. Our family has always experienced life together,and I wouldn’t want it any other way. It was 3:30 A.M. on Sunday, November 3rd, a bittersweet day, one that I was certainly excited about, but one that I knew would include more than a few tears. I made sure to leave everyone a note as well as the instructions for a little scavenger hunt game I had put together for the kids. I had hidden many little notes around the house; it would be their job to find each one before I returned home. My husband and boys insisted that they wanted to take me to the airport. So one by one, my pajama-clad boys came downstairs, popped on their shoes and jackets, and stumbled into the van. We arrived at the airport and said goodbye. I had to seriously work hard to keep the waterworks from coming on full force, but I kept it together. My flight would be six hours long. I popped in my earbuds and zoned out! I made sure to book a window seat. 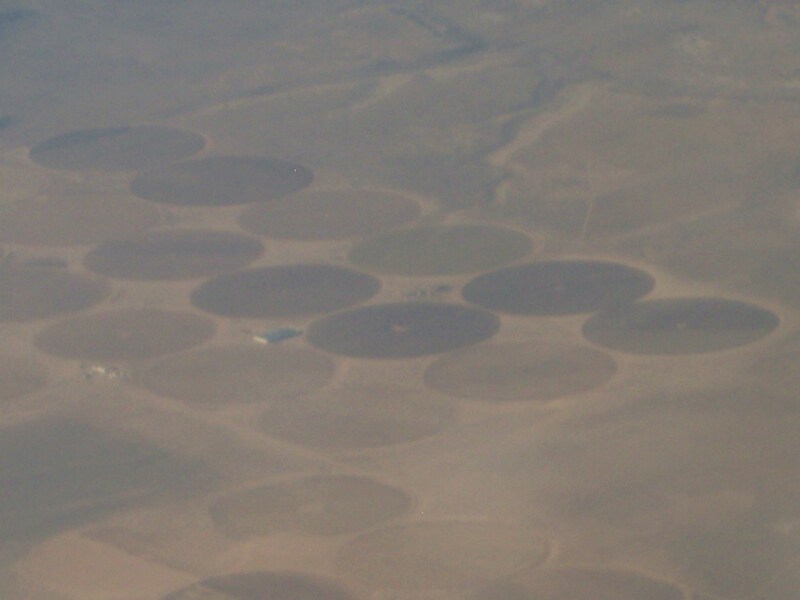 I had only flown cross country once a few year ago when we traveled to Arizona. That flight was at night, this one would be during the day. 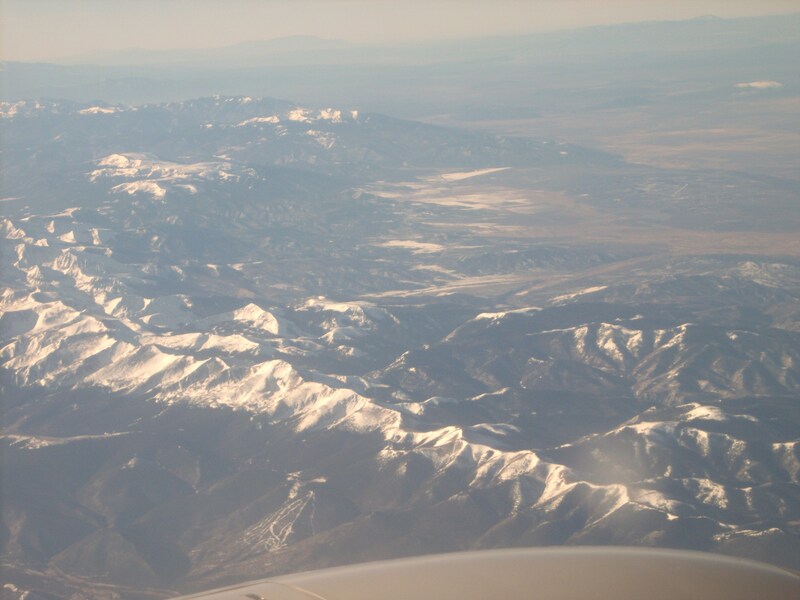 I was excited to see the landscape of the country change below me. And change it did! I am convinced that the people behind me thought I was completely nuts. I kept snapping pictures out the window. I heard them question, “What in the world is she taking pictures of?”. Plenty! From cityscape to forest, farmland to the Rocky Mountains, the Grand Canyon and the Hoover Dam, it was all spectacular to me. 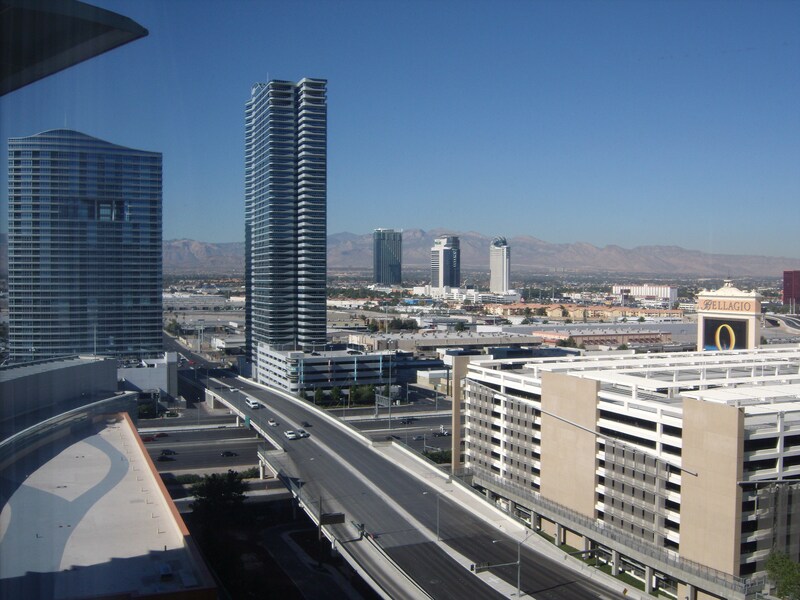 Before I knew it, the desert sands of Nevada were beneath me and the bustling Vegas scene was in front of me. And before my plane even made it to the gate, I realized that I would be grateful that my family remained home. The billboard at the end of the runway gave me a little taste of what Vegas was all about. 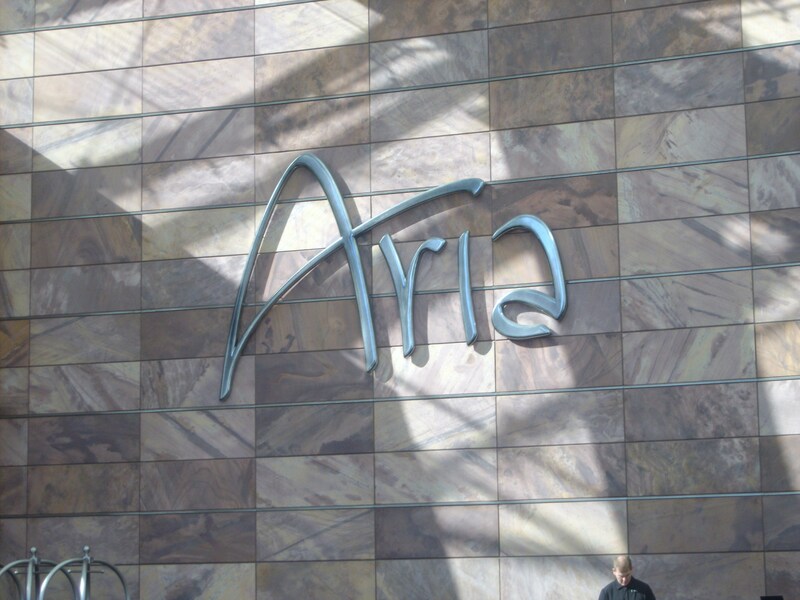 Finalists were whisked away to our hotel, The Aria. What a stunning hotel. 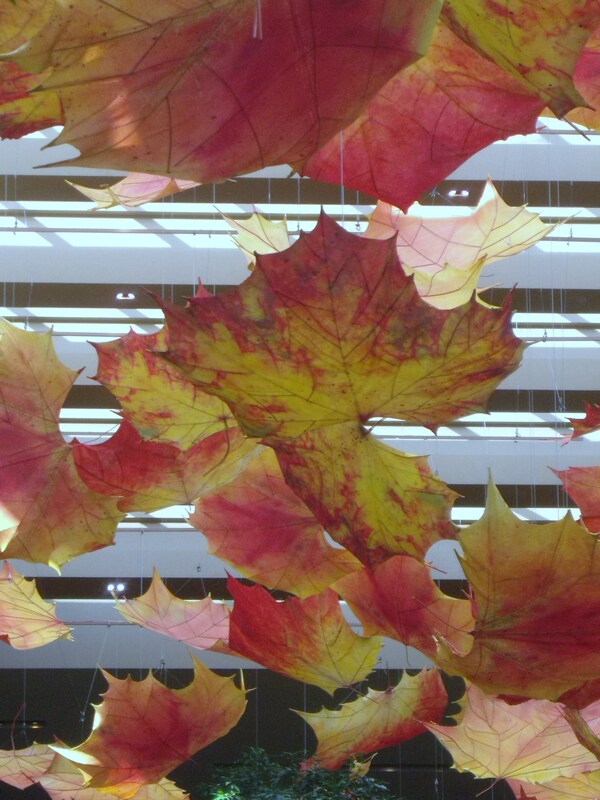 The moment I walked into the lobby I was greeted with these lovely suspended autumn leaves. I made my way to my room and kind of crashed. I had been up since 3:30 A.M. and crossed over a few timezones; this day was shaping up to be a marathon. I’d also need to get up at the crack of dawn to get ready and make it to breakfast and announcements on time. I would make my way up to the conference center (which seemed to be located in another world) where I would check in. We were given a goodie bag filled with some great treats. I loved it! It’s not everyday that mom actually walks away with a swag bag. I had an appointment to do an interview with Pyrex, then made my way to the GE Orientation where I would get a quick tutorial on how to operate the stove and oven. I knew the ladies had given their speech many times, but they were still so kind and gracious. I was reminded to be careful not to turn the oven off when I turn the timer on. Apparently it was a common mistake. It was exciting to see the conference area filling up with the excited faces of the other contestants. Lots of hugs, photos, and laughter were to be found. I saw the familiar faces of two women I had met at a previous cook-off. Everyone was so friendly; it really helped to take the nervous edge off. Soon enough we were all ushered into the ballroom that would host the Bake Off. Wow! Oh, Wow! What a sight to behold. 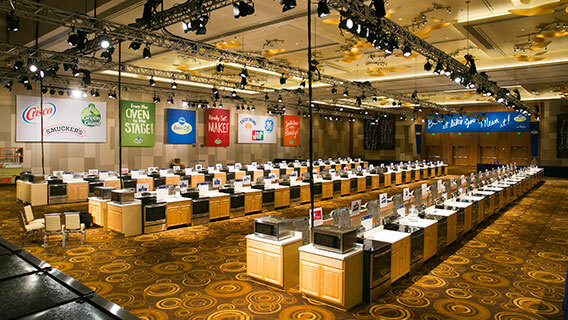 This huge ballroom had been transformed into 100 miniature kitchens. I could only imagine all the work, all the hands that had made this transformation possible. What would follow was a question and answer session that would make your head spin. The Bake Off has many sides, we were all about to see the legal side of things. Seemingly easy questions had either the most complicated response or one that was obviously something out of a memo from the Legal Department. I walked away knowing three things: follow your recipe exactly as you wrote it or you could be disqualified, do not accept or offer help to another contestant or you could be disqualified, and have your recipe into the judges on time or you will be in trouble! It was all starting to sink in…really sink in. 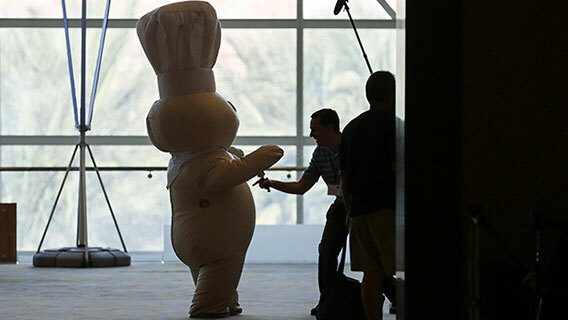 I saw the Doughboy…a life size Doughboy. Not many could resist running up to him and poking that squishy belly! I admit that I restrained myself, but I did chuckle at the sight. Our recipes and pictures were up for display in the lobby. Here we all were. We hailed from all over the country, from different walks of life. We were young and old, male and female, some who had done this dance once or twice before, and others, like me, who were clumsily stumbling through their first dance. But now, we were all connected. We shared a bond that couldn’t be broken. We were finalists for the 46th Pillsbury Bake Off. I know, I know. That sounds a bit hokey, but it is just true. Not many people get a chance to do this. The remainder of the evening saw us being entertained at a lovely welcome reception. Delicious food, good conversation, and the start of new friendships were all enjoyed. As I walked back to my room, I got to thinking about tomorrow morning. I would be cooking, not for my family, not for friends, but for judges, judges with the power to award $1,000,000. I was supposed to sleep tonight? Well, sleep I did, and might I add, with no problem courtesy of the most comfortable bed and pillows I had ever slept upon (Thanks, Aria!). On to the Bake Off floor in the morning! Next It’s Not All About the Dough! I love hearing about this experience! You’ve really built the suspense and I can’t wait for the next installment of this story. Thanks for telling us all about it. Great writing. You brought me back to the 46th PBO! Thanks, Nancy! So much fun at the Bake Offs. They certainly leave us with great memories!